One popular community outreach is the distribution of gift bags to local first responders. Long hours and hard labor that is both physically and mentally strenuous often leave members of police, fire, and other emergency services in need of a dose of encouragement; many Church of God congregations have opted to fill that need, and continue to do so at regular intervals through the year. It’s just another way they’ve determined to give life to their community. But not many have gone so far as Cloverdale Church of God in Boise, Idaho. They’ve not only opened their heart to local law enforcement, they’ve given them room and key. It all started a few years ago at a conference for church leaders in Anderson, Indiana, and with a particularly bright idea; thank you, Pastor Melissa Pratt of Teays Valley Church of God in Scott Depot, West Virginia! Tom Dougherty, lead pastor of Cloverdale was in attendance and couldn’t get his mind off the possibilities of a ’round-the-clock ministry to first responders. 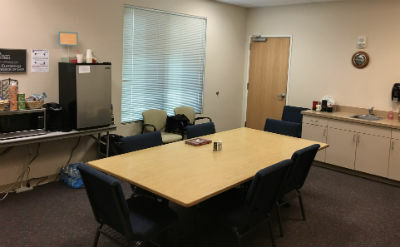 What if the church specifically designated a room in the church as a breakroom for local law enforcement? It may not be practically necessary in every community, but for Cloverdale, the potential impact looked promising. After all, the church is situated fifteen minutes from downtown and, as a result, could serve as an ideal, safe place for officers to take a break without having to commute back and forth. “The wife of one of our board members works for the sheriff department, so the connection wasn’t too difficult to make,” Tom recalls. Furthermore, the church had recently dealt with the department due to some burglary activity taking place near the church’s softball field. The opportunity was wide open to bring up the possibilities, and soon the doors would be wide open to local law enforcement to come and go, as they please, from what would become their new breakroom at the edge of town. A sheriff’s department vehicle parked outside. The location in the church was perfect. The room the church had available for such a purpose already had an exterior door. A keypad lock was installed so the church wouldn’t have to be open for the breakroom to be utilized. The space was also ideally positioned adjacent to restroom facilities and a TV was installed, along with a variety of seating options. 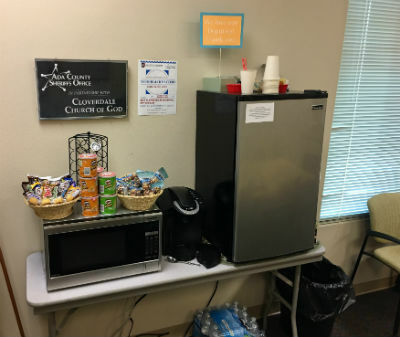 And, since no breakroom would be complete without coffee, water, and snacks, the church provides that, as well. The space is the perfect size for a law enforcement officers’ breakroom. During the holidays, the church steps up their ministry to law enforcement and leaves gift cards in the breakroom. The result of this new relationship with the officers has brought about several unexpected, wonderful consequences, including the fostering of relationships with a variety of other aspects of the community. One example of the effects of the ministry is the presence of a police vehicle at the church’s annual trunk or treat in the fall. Additional life-giving ministries at Cloverdale Church of God include, but are not limited to, Pastor Tom’s daily radio program, sponsorship of a Christian camp, the support of a local organization that cares for single mothers, a prison outreach, and the generous funding of Global Strategy missionaries. In Idaho, across North America, and around the world, God is on the move in the Church of God. Join the movement. Reach our world. Donate today at give.jesusisthesubject.org. 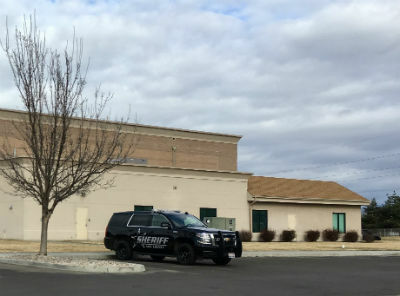 This entry was posted in All Church of God, Give Life, Western and tagged Boise, Cloverdale Church of God, community, first responders, ID, Idaho, ingenuity, law enforcement, officers, outreach, police, sheriff's department, TJ Samuelu, Tom Dougherty, unique ministries. Bookmark the permalink.